I’m connected to WiFi, but my Speaker is not discovered - soundseeder.com | Play music simultaneously on multiple devices. If your speaker is not listed, please check if your Player and Speaker are connected to the same Wi-Fi. 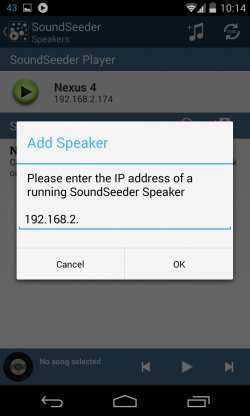 If your Wi-Fi network or your Android device does not support the autodiscovery of SoundSeeder, you can connect Players and Speakers manually with their IP address.